Welcome to this unofficial 2vs2 tournament :) This tournament is hosted a lil bit different than others, because there are no fixed dates & times but a deadline untill all games must be played. The Club season can also be seen as a League and it's a competition between players, the difference with a monthly tournament is that the league is played in several days and the players can choose when they play. The Clubs that earned the most points by showing enormous effort or tricky tactics and played at least ..
will progress to the next round. But above all, these are the teams that have been there since Day 1 and have shown themselves cooperative until every time it got blazing. Kudos to you, you deserve it. Serie A.1 is still open because none of the teams have played. AC Milan confirmed but Napoli didn't. The Serie A has been filled up with two reserve teams. All games can/should be played untill Sunday, the 14th of April - 20:00 CET. The Clubs will all first get randomized and then chronologically split. The first Club pulled always plays home with the advantage deciding between team hot and team cool. Draw is done with on Curve Fever's Channel at #offtopic. Minimal one player of every team has to be premium to sign up a team. Trying to cheat or sabotage the tournament will be punished. Depending on the severity of the offence it will be punished with a warning, points deduction (Yellow Card) or disqualification (Red Card). All participating teams are responsible for playing all games before the deadline ends. All Rules and Item settings can be viewed on schedule. If you have any questions about the tournament, please feel free to message me via private message on forum or in game, or gobeeyy#0819 on Discord. Just a "Wow" first for the whole structure+schedule. Sounds interesting. How do I qualify for the champions league? Premier League and Bundesliga need to finish 1st or 2nd place. La Liga and Ligue 1, Serie A and Eredivisie need to finish on 1st place. How do I qualify for europe league? Premier League and Bundesliga need to finish 3rd or 4th place. La Liga and Ligue 1, Serie A and Eredivisie need to finish on a 2nd place. 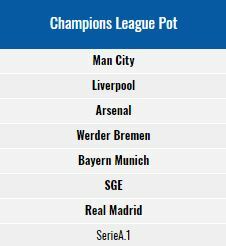 As far as I can see the Premier League and the Bundesliga have for both tournaments better chances to advance to the champions league/europe league, so isn't this a little bit unfair? Seems like "first comes first served" and you can place yourself into the easier leagues. So my question: Isn't it better to randomize the teams over the leagues(first sign up, then randomize and choose team after that) or get a structure like: "teams with highest teamrank average will be placed at the better leagues" or something like this? @Nowodny That's a good point you address there. My idea was that the players would judge themselves and the advanced would rather play in an A group, while the less experienced players sort themselves into a B group. My second thought was to sort the teams by personal assessment. But, I think that's too unfair, because it's just my opinion. Sorting by Rank would also be unfair, as inactive players who are actually good could have a disadvantage. I think the idea of randomly sorting teams is not bad at all. I don't think your comment is correct. "Why does everything have to to with soccer". Do you mean "Why does CF2 have to do with soccer?" I'm sorry if I don't understand your viewpoint from your perspective, but from my perspective, I think it differently. Overall, I will give applause to Nimo' for such hard effort that is being put into this spontaneous event and it will be a memorable event as it is clearly different to all other events that Curve Fever 2 had in the past. The spreadsheet is beyond what I thought it would be as I did have a sneak peek of the spreadsheet, and I want to thank you for the time and effort that you have put into an event and the spreadsheet. I will be looking forward to this fabulous event and I hope many players will partake into this event. Nimo' deserves a beer just for the creation of the excel spreadsheet alone! I'm in with Blaizzy. We'd to play as ManUnited in Premier League. I'm in with Kafkaesque. We'd to play as ManUnited in Premier League. I'm in with I'm Phenomenal. We'd like to play as Arsenal in Premier League. I'm in with Thor Edinson. We'd like to play as Arsenal in Premier League. Hello there! And amazing work you've done with that Excell! I have this silly doubt... I used to play a few years ago and now I see there's a new version (CF pro) so... Is this tournament for the old version or the new one? Once again, sorry for this silly question but I'd like to join in case it's for the new one. I'm in with CarnageFX. We would like to play as Manchester City in Premier League. I'm in with the one and only beast 'Alicia. We would like to play as Manchester City in Premier League. I'm in with Pocahontas'. We'd like to play as AC Milan. Im in with my mum works for HMG, we'd like to play as AC Milan. I'm in with Ninaballeria as Swansea City (sounds cooler as liverpool) in Premier League. Premier League & Bundesliga -> Let the battles begin! Serie A and La Liga both need atleast 2 more teams to sign up! We'll give both Leagues enough time ( untill Monday, the 18th of March 2019 - 20:00 CET ) to fill up with atleast 2 more teams each group. If somehow they won't fill up in time, we'll have to put both teams into one group. I'm in with Bokki. We'd like to play as Sassuolo in Serie A.
I'm in with Negatus'. We'd like to play as any club in Premier league, if not possible then Real Madrid in La Liga. I'm in with Nuddesy. We'd like to play as Real Madrid in La Liga. Im in with Kiver. We'd like to play as Juventus in Serie A. If you have any questions about the Changes, please feel free to message me via private message on forum or in game, or gobeeyy#0819 on Discord.